ReStore sales are growing fast! We need volunteers like you who want to make a difference and join a wonderful team at the ReStore. Want to learn more? Take a look at the opportunities below, then click on a position you find interesting! Or use our online scheduling tool. Also, be sure to check out these volunteer biographies to see what current and past volunteers have to say about volunteering at the ReStore! Tuesday-Friday – (10am-2pm, 12-4pm, 2pm-6pm) ReStore Volunteer. Saturdays – (10am-2pm, 12pm-4pm) ReStore Volunteer. Our volunteers who make a weekly commitment are a crucial part of the ReStore team. Put your dedication and skills to good use by taking on a specific department, repairing merchandise, leading volunteers, planning special projects or helping with the day to day operations of the store by receiving donations, answering phones, cashiering and helping customers throughout the store. Click on the different positions below for more information. Looking to volunteer as a group? We love volunteer groups! Pull together your friends, family or coworkers and have fun making a difference. 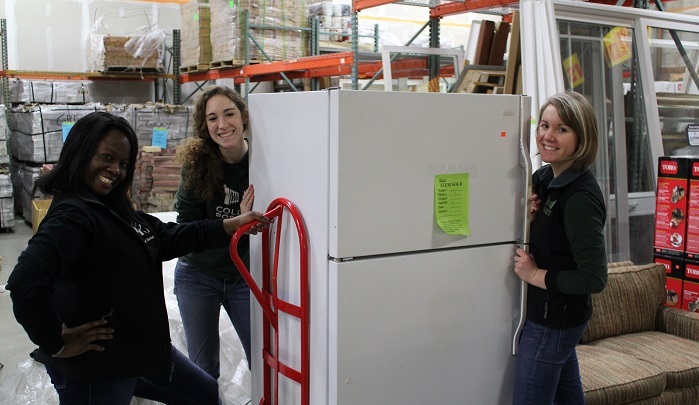 Volunteer groups help us run the Habitat ReStore. We welcome all types of groups – corporate, faith based, non-profit, youth, and community groups. We also have opportunities for groups who wish to volunteer on a regular basis, check out the Regular Crews page for more information. Many opportunities are available! Click here for more information. Have a question about volunteering at the ReStore?